Greetings and welcome, Nhor. We’re speaking at what seems to be an important moment for you. Those that have been following your releases know what a beautiful and genuine expression of music they are, but Within The Darkness Between The Starlight far exceeded my high expectations. It’s a massive, intricate, heartfelt work of art, and easily one of the best things I’ve heard in some time. Was there a certain impetus or significance behind the creation of this album, or was it a more instinctual culmination of your early works? “Within The Darkness Between The Starlight” was definitely an instinctual progression for me. As I hope you will come to realize, Nhor is a project of discovery for myself. It is an onward journey. The album was of a perspective that I had come to find at the time; a perspective on who and where I was. This isn’t something I can describe in a single sitting. It is enough to say that the contemplations that gave rise to this album changed the way I view my existence. Nhor’s sound merges elements of earthen black and doom metal with ethereal ambient and neoclassical melancholy. It’s not an uncommon mixture, but you’ve always managed to make each aspect distinct to your own sound. What is it about these styles of music that fulfills your vision for Nhor? There are many aspects within those musical styles that appeal to me and fit in with what I am trying to portray. Blast beats to me summon vastness. As if to stand on a mountains edge and overlook all of the valleys below. Slower, doomier parts are a nod to time. Consider how many ages a tree takes to grow, consider the time span of a forest and all that it has seen. The ambience refers to that unexplainable energy that I feel if enough time is spent within a forest or looking up into the heavens. Piano pieces may at times be simplistic but they mirror the elegance of nature. Within The Darkness Between The Starlight seems to me an almost perfect integration of those aforementioned poles of your sound; the “glimmer” of the piano and the “growth” of the metal. How do you view your older material, especially your last album, Whisperers To This Archaic Growth, in retrospect of the new album? Do you see yourself separating those aspects of your music again in the future? Whisperers To This Archaic Growth was actually meant to be my second release. It was partly written and recorded during the process of gathering the songs for my first self-release. I unfortunately lost all of the drum tracks, which postponed its release date. “Upon Which Was Written Within The Stars” was the true path forward so “Within The Darkness Between The Starlight” is following on from that. My next album is in fact already written and almost completely recorded. I have definitely taken one path this time, but I will not be the one to reveal which yet. “Rohmet Etarnu” revisits the theme of “Giantess” from the self-titled album. It makes for a pleasing connection to the project’s beginnings, but I get the sense that there’s something more there. Could you share the significance of this recollection? Are there other instances of past songs interweaved into Within the Darkness Between the Starlight I haven’t spotted yet? They do share the same subject, which can be found within the words “Rohmet Etarnu” if you haven’t figured it out already. After reflecting on the subject of Giantess I came to realize that my initial thoughts were somewhat misguided and only reflected one side. “Rohmet Etarnu” encompasses the incredible force that I had overlooked by only viewing the forests through a human perspective of time. You take a many layered approach to Nhor that incorporates the music, stories, and visual arts to a degree that is highly uncommon for most bands. Do you view Nhor primarily as a musical project, or do the other elements have just as prominent of a role? Do you think those that download but don’t buy the physical releases are missing a significant part of your albums? Have you or would you ever publish literature totally separate from your music? Nhor is more than a musical project to me. It is a way of living for myself. It’s my outlet for expression. I understand that people connect at different levels and respond to different mediums of expression better. All of the elements are important, for myself it is the music, although I understand that for another that may not be the case. Which then leads me to downloads. It is obviously not how I intended the release to be received, but if that is how people choose to connect to my project then I will not fight it. It is better than them never doing so. I have in fact already published literature without music. It was entitled “A Pale Glimmer” and was released in a very limited A2 print edition. One side of the print was an essay covering the general theme of the stars and our place among them. The other was a hand drawn illustration undertaken by Sin-Eater. The songs on Within The Darkness Between The Starlight have a very satisfying, narrative structure to them that far surpasses what’s possible in more traditional verse-chorus approaches. Were there any particular influences that helped you develop your method of shaping songs? I am a self-taught musician and I suppose artist. I do not see the need to follow other people’s paths of creation. Music to me is more often than not a journey, or the result of contemplating a subject for some time. Therefore verse-chorus styles of song rarely appear in my work. I suppose my influences are anyone who has created art on their own terms. Nhor is my creation; created by an outward reflection of myself, which is mirrored in the waters of an overgrown forest, bringing the stars and trees together in it’s rippling reflection. The British Isles, despite being the homeland of some hugely influential bands, have always had a relatively sparse history of extreme metal outside of doom. That seems to have changed in the past few years, with bands like Wodensthrone, Primordial, Fen, Altar of Plagues, and others drawing a lot of attention. How do you feel Nhor fits, or doesn’t fit, into the heritage and present-day community of metal in the British Isles? I honestly have no idea and it isn’t something that interests me. I have read gushing reviews of albums, and had friends also rave about them but I have found no connection to them. Music is subjective. There are many well known bands that I do not have much time for and yet many that I see criticized whom I appreciate. I have never felt part of a “community” in that respect and don’t suppose I ever will. This is my project, for myself. I have received no support and do not look for any. In fact, I believe I am creating from a different perspective to all of the bands mentioned previously. You’ve created a somewhat enigmatic and secluded atmosphere around Nhor, even going as far to simply refer to yourself by the same name. This has the effect of not only focusing the attention on the art over the artist, but in a sense it severs the divide between the two. Why does this approach to the relationship between artist and listener work best for Nhor? I have no need to make my name, face or any information about myself public. That isn’t to say that I am actively trying to hide it; I just don’t see how it adds anything to the project? If anything it would only serve to take away from it. It is Nhor that I want people to focus themselves on. My name is indeed not Nhor, but I am Nhor. There is a name I was given at birth, and that is the name of my body. 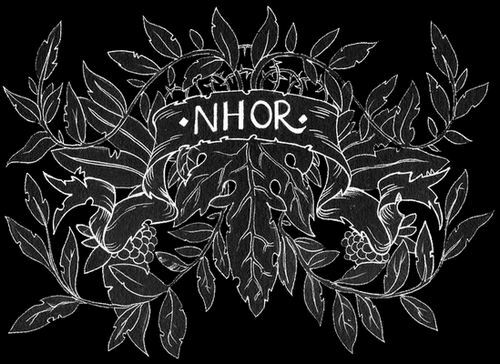 Nhor is who I truly am, in some sense it is the name of my soul. I would rather speak of Nhor than of a name given to me. All of Nhor’s previous albums have been self-released affairs before now, but you still seem to have gathered quite a dedicated following. How has working with Prophecy changed things for you so far? Prophecy had been in contact with me almost from the very beginning. Signing with them was the natural outcome really and wasn’t rushed for either party. I had time to grow into the project I wanted to create and now Prophecy themselves have a more refined artist also. I decided to sign with them in the end because I felt as if I had taken Nhor as far as I could by myself and did not want to stunt the project. I realized it was time to let go of doing absolutely everything myself and time to let the project grow. It seems to be working well so far! I do indeed have some dedicated fans, many which own every single release from the very beginning and I appreciate their support very much. Towards A Light That Dwells Within The Trees is a very special compilation, featuring all of your released works along with the accompanying stories and a book of illustrated art. Not many bands would have the opportunity, or even the desire, to honor their music with such lavish attention. How did this release come about? Did you see a necessity for it considering the limited nature of your physical music beforehand? It is something I have always had in mind. I frequently receive messages from people asking if I have any remaining copies of sold out releases, or where they can find them now. Prophecy have also opened my project up to a whole new set of listeners, and this is a great way to bring them up to speed on the project and how I came to be “Within The Darkness Between The Starlight”. I don’t think I felt it a necessity, as this project is an onward progression, so I have no desire to go backwards. But the artbook has definitely been a good way for me to solidify where I am now. The artist Sin Eater seems to me to be an integral component of Nhor at this point. His gray-scale art has considerable effect on the specific aura that Nhor has. Is his work more of a collaborative or dictated contribution to Nhor? Do you see yourself continuing to work with him in the foreseeable future? I suppose it is a dictated contribution. But I cannot dictate his style or talent. As all of my artwork is part of a bigger picture and story it’s important that I dictate certain aspects. I tend to have an image in my head that I then sketch as best I can. I give this image to Sin Eater with many notes and let him get to work. He then updates me frequently with the progression of the piece. It’s a relationship that has worked very well so far. Would you consider playing live if the right opportunity came about? Maybe as something more rare and special like Syven and Vemod have been doing? Do you think there’s any room for growth in terms of Nhor having more of a communal rather than solitary outlet in this sense? I have been asked on quite a few occasions to play live but I don’t think my project is ready for it yet. If I ever were to play live, it would be when the time is right and when I have put enough thought and energy into it. I believe that my music is best listened to alone and on the terms of the listener. Mic stands, cables, sweaty venues are not what inspired the music and so have no place in my eyes to appear in a Nhor performance. What’s your process for creating your art? Where do you draw from or stumble into that initial spark of inspiration? Does the creative process begin with the stories, the music, or something else entirely? As I have mentioned this is a project of discovery. The creative process starts long before the stories and music. At times I have been urged to create by omens. Ever since that first night where an animal caused me to rediscover the piano I have taken note of any such occurrences and made time to focus on Nhor. I’m sure it is no secret that my main inspirations are the natural world. Mainly the forests and stars. They are the places where I go to think and consider. They are where I go to let my mind wander and wonder freely. They are the back-drop to which my own thoughts and feelings are set. While Nhor is clearly far above anything as shallow as a political band, I do get the sense that there is a very definite intention and vision at work behind these powerful compositions. 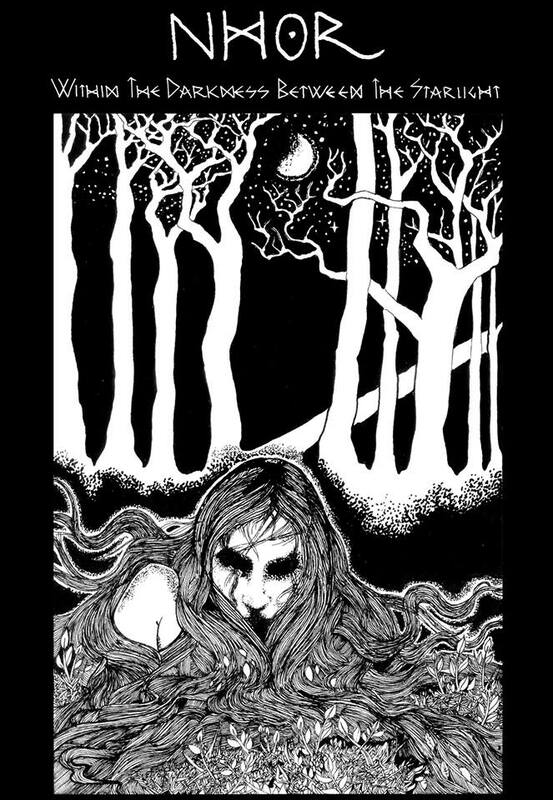 You seem in certain ways to share a similar philosophy with other bands working from a black metal foundation like Fauna, Woman Is The Earth, Blood Of The Black Owl, and many others. Do you feel any kinship between yourself and others working in this somewhat new realm of music? Unfortunately not, I do not feel kinship with any other musicians if I am honest. If they are on the same journey of discovery as myself then I wish them luck. Music is an art form. It should be unique for each and every artist. I understand that we may rest beneath the same tree, but what branches do we look upon? What stars hide behind the leaves we see and which ones shine brightest to them? There’s a heavy sensibility of wonder and reverence for the greater-than-human world in your works, but it’s tightly bound to a feeling of profound grief; particularly on Whispers To This Archaic Growth. It’s appropriate to the time and place we find ourselves in: people are starved for a sense of belonging in this world, but to open oneself to it means also facing the despair of the violence and loss that’s been inflicted on it. What do you think the value of exploring these feelings is? Donny Miller said “In the age of information, ignorance is a choice.” And as Carl Sagan once said, “It is far better to grasp the universe as it really is than to persist in delusion, however satisfying and reassuring.” Nhor is the outward expression of my revelations in discovery. I have seriously asked myself who and what I am. Where do I exist? When have I existed? I have grown to be much more than I ever was before. There is a certain sadness that I have always carried with me and still do to this day. When I started to discover some of the darker sides of our existence this only seemed to sympathize with my own feelings. But since then I have learnt far more and my once blinkered view has opened up to the incredible nature of existence. Unfortunately this unknown sadness still clings to my back, but it has become somewhat of my companion. You clearly have a strong relationship with the Earth and the wider universe that encompasses it, and this seems to be the driving force behind your works. Do you think music has the capability to promote or stimulate a connection to or wonder for nature in some way? I hope so. The Earth is the only home we’ve ever known. It is important that we feel connected to it. We are of the Earth and it too is of ourselves. Humans have the ability to shape this world, for better or for worse. Human kind cannot afford to be as self obsessed as it currently is. If my music is able to light an unconscious spark in someone to venture out from the towns and cities and to develop some kind of connection with the true Earth then I would be happy. “Beneath The Burial Leaves Of A Dying Earth” ended Whispers to this Archaic Growth on an ominous note. Within The Darkness Between The Starlight closes with “Alnilam”, which, relative to the rest of your discography, is a surprisingly warm and quietly joyful song. “Beneath the Burial…” feels to me like a door closing, while “Alnilam” is more like a gentle opening, in a way that is very moving to me. Why end on this note for this album? Could you articulate what it is you saw there? That is very observant. “Alnilam” was infact the first song written for “Within The Darkness Between The Starlight”. It was also originally entitled “Return”. As the theme and ideas for the album had progressed in my mind I came to the point where I needed to find the end. This was one of the first times I had sat at the piano since my previous releases. It felt very much like the return of Nhor, but also all I had running through my head was the culmination of the “Within The Darkness Between The Darkness” story and ideas behind it. The song is somewhat of a door opening, in one respect to Nhor’s return, and another to the new stand point in which I found myself after my revelations during that period. Imagine that music is a spell. It has the capability to affect and alter the relationship of the human listener to the world. Beyond this, imagine that the non-human world is a perceptive entity; every stone attuned to every insect, every drop of water attuned to every tree, every creature attuned to every star. They listen and are influenced as well. How would you hope for Nhor to change the people? What sort of song would you sing for the animals and the mountains and the distant stars? Music is a spell, there is nothing to imagine. It is made of vibrations. Vibrations that can cause you to experience all kinds of emotions and thoughts regardless of your wishes or current state. Don’t under appreciate where we find ourselves. Try to imagine nothingness. Imagine somehow that you have never experienced existence. Not a single colour or shape has ever entered your mind. No emotions have ever arisen. No sounds have ever broken pure silence. No weight has ever pressed against you. You are formless, you are zero. From nothingness, and nowhere the sound of wind passing through trees appears. Is this not magical? Is this not incredibly beautiful? Every single moment is a gift, every single experience that your mind is able to gather a great treasure. There is no song I could sing that is not already being sung. And it is being sung so loudly that our ears have overlooked it’s great span as background noise. I’d like to end by expressing my gratitude. I deeply appreciate the gift of your time and feelings in answering the questions, and I congratulate you on what you’ve accomplished with Nhor so far. I’ll leave you with the last words on this interview. Thank you for taking the time to explore my project and for this interview. Great interview. Very well written, very insightful and thought provoking, by both you and Nhor. Thanks! This entry was posted on October 9, 2013 at 7:06 pm and is filed under INTERVIEWS.You can follow any responses to this entry through the RSS 2.0 feed.You can leave a response, or trackback from your own site.